These short stories are like snapshots in time, the way things were in passing, not stories that conclude, but rather flashes of action that are left to run on in our own imaginations. There is a good diversity of main characters each with their own stories, stories painted with good supporting casts. There is a partial end point to a couple of the stories that strongly determines direction, but basically the reader is left with a great deal of adventure. These glimpses into other's lives are set in French, English and Spanish speaking environments. I'm sure that they reflect by degrees not only Rogers observations and also his own experiences across the world. As with all collected works, some will interest any individual reader more than they will another. All though are enjoyable and encouraging of thought long after the book reading device has dropped into stand-by mode. This is a short book, quality rather than quantity, and well worth the little it costs. I only ever read e books, so that is all I base value for money on. There are some really novel backdrops that give life to the stories; moments in interesting lives that are given penetrating depth by very good quality writing. I found enough variety that I could read the whole book as a one off. Actually I read in two or three sessions as I travelled. These are each fifteen minute reads for those that are fairly slow page flickers, just right for so many moments when it is we, ourselves, on standby. 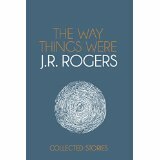 I wouldn't be at all surprised if Rogers picks up a lot of readers for his novels from the thought waves generated by this collection.